LONDON - A new oil sheen has been spotted in the Gulf of Mexico, although energy company BP said Thursday the discovery had nothing to do with its operations and was far from the site of its disaster-hit Macondo well. BP spokesman Daren Beaudo said his company had sent several remotely controlled mini-submersibles into the water over the weekend to investigate the source of the sheen  a shiny coating that floats on the surface of the water which generally comes from leaked or spilled oil  but had concluded "that it couldn't have been from anything of ours." According to an online map published by the U.S. Department of Energy, the Green Canyon Block  a huge square-shaped area of water south of Louisiana  is south and west of the Mississippi Canyon Block where the Macondo well blew up. "They are not investing any sheens in the vicinity of the BP well," Paul Barnard, Operations Controller for the New Orleans sector of the Coast Guard, told the AP on Thursday. "We're talking 10s of miles if not further," he said. A catastrophic April 2010 explosion at the Macondo well killed 11 men and led to the worst offshore oil spill in U.S. history. 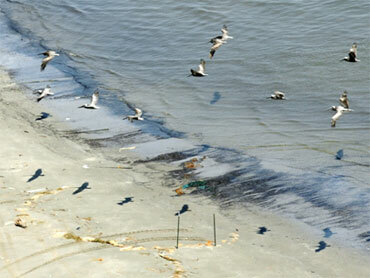 The stricken well spewed more than 200 million gallons of oil into the Gulf before it was capped some three months later. Among them is Royal Dutch Shell PLC, which is still investigating the cause of a recent oil spill in the North Sea  the area's worst in a decade. The Dutch company counts several projects in the Gulf's Green Canyon Block. Exxon Mobil Corp., Chevron Corp. and the Bureau of Ocean Energy Management, Regulation and Enforcement did not immediately respond to AP calls for comment. Some oil naturally seeps from the floor of the Gulf and the AP has reported that at least 27,000 abandoned oil and gas wells in the Gulf are not routinely inspected when plugged or subsequently monitored for leaks. In an email, London-based BP spokeswoman Sheila Williams noted that "there is a lot of sheen in the Gulf of Mexico area."